This luxurious moisturizing Bath Bomb is infused with the finest Lavender essential oil sourced from the fields of Provence to soothe away the stresses and strains of modern life. As the gently fizzing Bath Bomb slowly releases the classic aroma of the Lavender essential oil, you will begin to feel its calming effects on your mind and body as you drift into your own peaceful, inner sanctuary. Meanwhile, the botanically enriched formula of Shea and Cocoa Butters work to condition and deeply moisturise your skin, leaving it refreshed, soft and silky smooth. 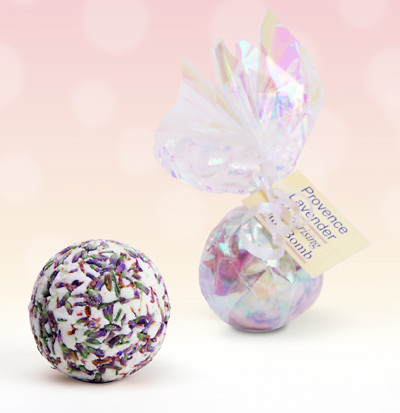 Each Moisturising Bath Bomb is hand rolled with Lavender petals and is individually gift-wrapped in beautiful iridescent film-wrap making it an ideal gift for someone special. Please note - Unlike many of the larger, tangerine-sized bath bombs that contain only fizzy bicarbonate of soda, these compact-size Moisturising Bath Bombs are highly-concentrated and packed with high quality, natural botanicals of Shea and Cocoa Butter to soften the bathwater and moisturise your skin. Don't let the compact size fool you - your skin will certainly be able to tell the difference between these Moisturising Bath Bombs and the plain bicarbonate of soda ones! Sodium bicarbonate, Citric acid, Theobroma cacao, Zea mays, Butyrospermum parkii, Ammonium lauryl sulfate, Lavandula angustifolia (flowers & oil), Lavandula latifolia, Juniperus vigininiana, Rosmarinus officinalis, Melissa officinalis.